A new report on the effectiveness of the French three-strikes anti-piracy law claims that it managed to cut Internet piracy in half last year. While lobbyists are making preparations to show these great results to politicians worldwide, there is one thing the report fails to mention. Despite the claimed decrease in piracy, revenues through legal channels are down as well. This is strange, because in previous years these losses were solely attributed to piracy. It’s a cheerful day for the copyright industry. In France the controversial “graduated response” law (Hadopi) has evaporated unauthorized file-sharing. A new report from the Hadopi office, conveniently written in English so it can be used by lobbyists all around the world, is claiming the following. The report goes on to cite a variety of statistics ranging from a 29 percent decrease in visits to “pirate” sites in 2011, to a 66 percent drop in illegal file-sharing traffic in France in the same period. Impressive figures indeed, and Hadopi is quick to point out that it’s directly related to their three-strikes law. While we’re not going to dispute the validity of the provided statistics, it is worth pointing out that there’s something missing from the report. Something big. For more than a decade the entertainment industry has claimed that digital piracy is the main cause for the gradual decline in revenues. So if piracy is down massively in France, one would expect that the revenues are soaring, right? But they’re not. If we look at the French music industry we see that overall revenues were down by 3.9 percent in 2011. Likewise, the French movie industry is still going through a rough period with revenues dropping 2.7 percent in 2011. Ironically, an industry insider even blamed online piracy for this drop. To sum it up. in 2011 online piracy was slashed in half according to the Hadopi report, but despite this unprecedented decline the movie and music industries managed to generate less revenue than in 2010. If we follow the logic employed by the anti-piracy lobby during the past decade, this means that piracy is actually boosting sales. But that would be a silly conclusion wouldn’t it? As we’ve said in the past, we think that the entertainment industries are overlooking a very significant third factor – technology. In the music industry, for example, highly profitable CDs are being replaced by less profitable MP3s, subscription services and free streaming services such as YouTube. It wouldn’t be going too far to say that the Internet has revolutionized the music industry. File-sharing is obviously a by-product of this digital revolution, but its effect on revenues has been much overstated. 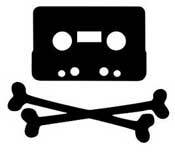 The music industry continues to blame piracy for its troubles, even though digital sales, which directly compete with piracy, are booming. Could it be that the format shift from physical to digital music, and the change in buying habits that came along with it, may explain the decline in revenue more than piracy can? The Hadopi report is suggesting that this may indeed be the case. The worst part is of course that this is not how the anti-piracy lobbyists will use the report. That would kill their business. Instead, they will use the report to show how immensely effective anti-piracy laws can be, lobbying for similarly draconian laws all over the world. c There are 148 comments. Add yours?